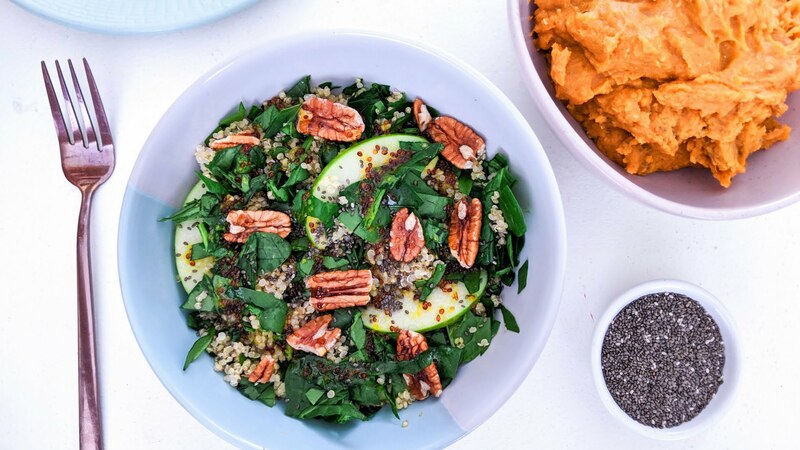 A nutritious meal that packs a packs a plant protein & iron punch, this simple salad with sweet potato mash is boosted with chia seeds to help energise you, improve your heart health & aid healthy digestion. Take The Chia Co’s Chia Challenge & reap the health benefits of a daily serve of chia seeds. Packed full of fibre, omega-3s, plant protein, minerals and antioxidants, chia seeds can make you feel better and aid digestion & heart health, when consumed as part of a healthy, balanced diet. Click here to take The Chia Challenge for FREE. Cook quinoa according to packet instructions and place in a large salad bowl, allow to cool. Add remaining salad ingredients to quinoa bowl and mix. Combine dressing ingredients in a small bowl, stir until evenly combined. Pour over salad. Steam sweet potato until soft. Place into a blender and combine with chia seeds & cumin until smooth. Scoop out and serve with salad. Enjoy. 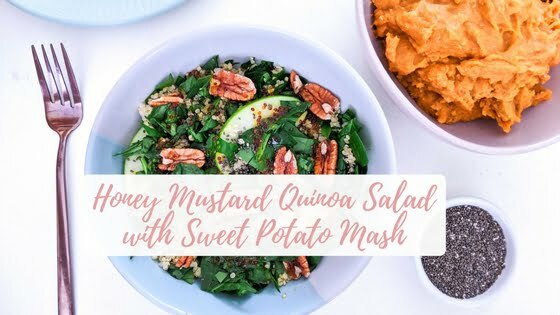 Is sweet potato better than normal potato because it has more variety of minerals? Thanks Jasmine! Both white potato & sweet potato are excellent however sweet potato does have a special compound called beta carotene which is very healthy for you! !